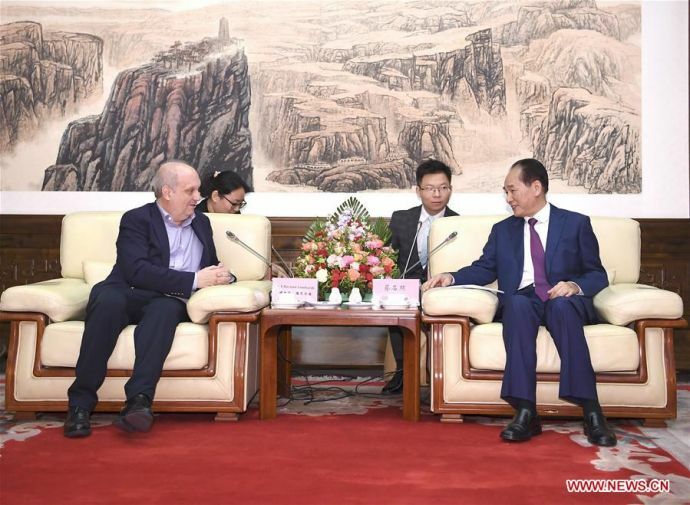 Abstract : Cai Mingzhao, president of Xinhua News Agency, Thursday met with Hernan Lombardi, minister of the Federal System of Media and Public Content of Argentina, discussing ways to enhance media cooperation and preparation work. BEIJING, Sept. 13 (Xinhua) -- Cai Mingzhao, president of Xinhua News Agency, Thursday met with Hernan Lombardi, minister of the Federal System of Media and Public Content of Argentina, discussing ways to enhance media cooperation and preparation work for this year's China-Latin America Media Summit. Active interactions between Chinese and Argentine leaders in recent years have pointed out the direction of the two countries' comprehensive strategic partnership, Cai said. Saying the media should play its role as a bridge linking the people of China and Argentina, Cai stressed Xinhua will help deepen the two countries' friendship through objective and accurate coverage. He said Xinhua stands ready to intensify communication with the Argentine side in preparation for the upcoming China-Latin America Media Summit, so as to make it a success and facilitate people-to-people exchanges. Saying many Argentine media organizations keep close cooperation with Xinhua, Lombardi promised the Federal System of Media and Public Content of Argentina will press ahead with exchanges with China and prepare the China-Latin America Media Summit with full efforts.